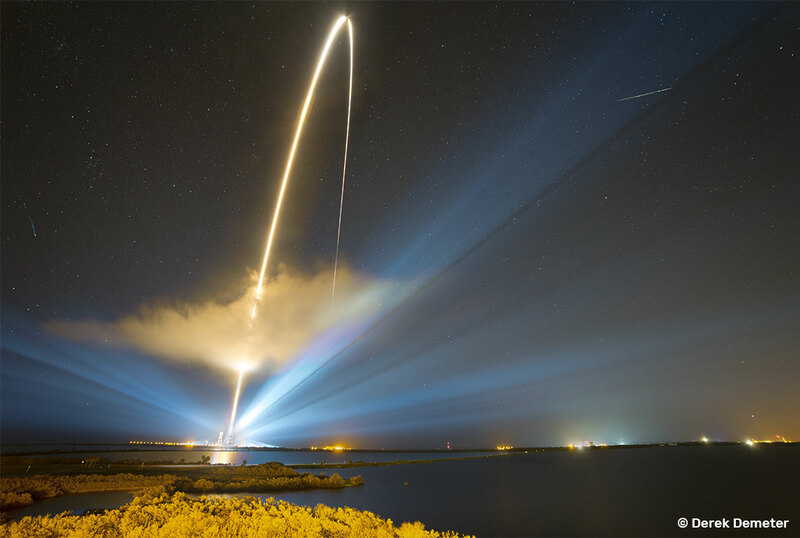 Perseid meteor and Delta IV Heavy rocket trail over Cape Canaveral on August 16, 2018. During this period the moon will reach its first quarter phase on Sunday September 16th. At that time the moon will lie 90 degrees east of the sun and will set near midnight local daylight saving time (LDT). As the week progresses the waxing gibbous moon will set later and later, shrinking the window of opportunity to view meteor activity under dark skies. The estimated total hourly meteor rates for evening observers this week is near 3 as seen from mid-northern latitudes and also 2 for those viewing from subtropical southern latitudes (25S). For morning observers the estimated total hourly rates should be near 14 for those viewing from mid-northern latitudes and 10 for those viewing from subtropical southern latitudes (25S). The actual rates will also depend on factors such as personal light and motion perception, local weather conditions, alertness and experience in watching meteor activity. Evening rates are reduced during this period due to moonlight. Note that the hourly rates listed below are estimates as viewed from dark sky sites away from urban light sources. Observers viewing from urban areas will see less activity as only the brighter meteors will be visible from such locations. The last of the chi Cygnids (CCY) are expected this weekend. 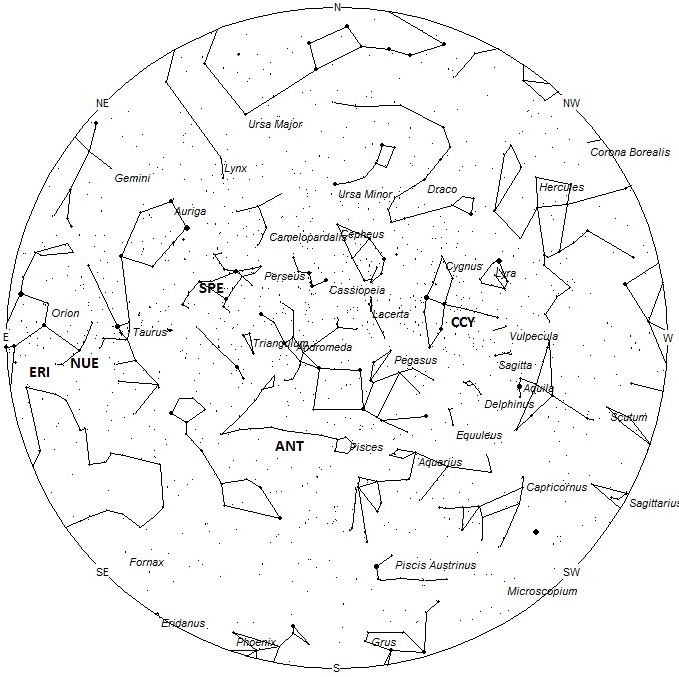 The radiant currently lies at 20:12 (303) +32 which places it in central Cygnus, 2 degrees west of the faint star known as 39 Cygni. Rates are expected to be less than 1 per hour no matter your location. This radiant is best near 22:00 (10pm LDT) when it lies highest in the sky. With an entry velocity of 15 km/sec., the average chi Cygnid meteor would be very slow. 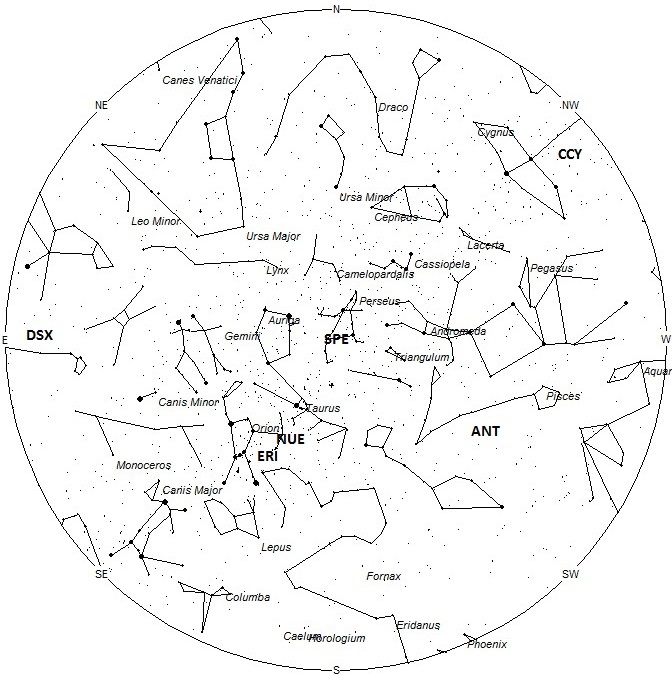 The center of the large Anthelion (ANT) radiant is currently located at 00:28 (007) +03. This position lies in southern Pisces, 5 degrees southwest of the 4th magnitude star known as delta Piscium. Due to the large size of this radiant, Anthelion activity may also appear from northwestern Cetus as well as Pisces. This radiant is best placed near 0200 LDT, when it lies on the meridian and is located highest in the sky. Hourly rates at this time should be near 2 no matter your location. With an entry velocity of 30 km/sec., the average Anthelion meteor would be of medium-slow velocity. 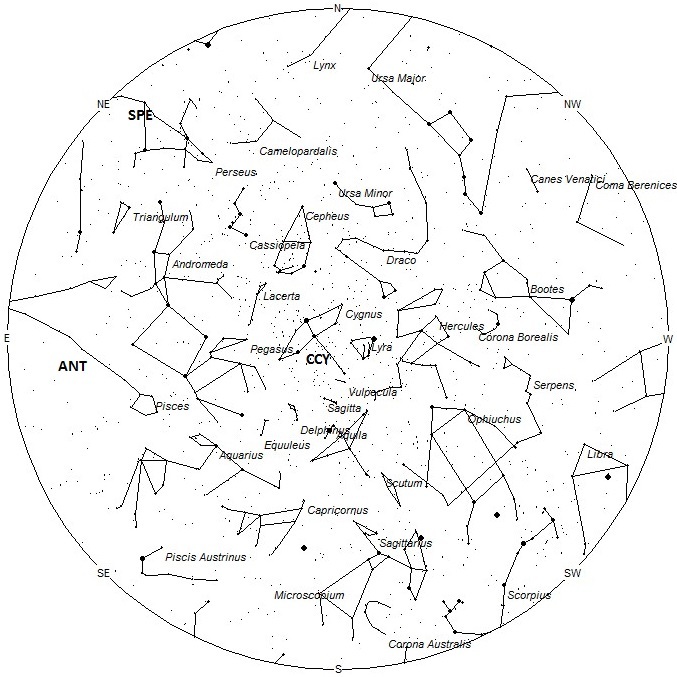 The September Epsilon Perseids (SPE) are active from September 3 through October 3 with the peak occurring on the night of September 10/11. The radiant is currently located at 03:40 (055) +40. This position lies just 3 degrees west of the 3td magnitude star known as epsilon Persei. The radiant is best placed near 0500 LDT, when it lies highest above the horizon. Rates are expected to be near 1 per hour as seen from the northern hemisphere and less than 1 as seen from the southern hemisphere. With an entry velocity of 65 km/sec., most activity from this radiant would be swift. I saw something this morning over Memphis Tn. Unbelievable! So fast and bright. it looked like it must have been big when it burned. It was white and the streak was triangular like streak that had a green colored out line. It was moving down but so fast it was a lot faster than lightning. I love this stuff but not real science. If there was a tracked event between 3:00am and 4:00 am north of Memphis Tn, I would love to know. Anyone with know how and data whiling to tell Me?! Or where i can look? Im in Central Florida, I definitely just saw some activity in the Southeastern Skies, 5:55am approx, I can not find any verification, though, I definitely witnessed it as it broke through into lower atmosphere. Did you see it?? Please advise. Saw something amazing in the sky in South Florida around 11:45 PM September 21st, Friday Evening. I have never seen anything like it so I went on a google search and found this page. Not sure what it was, way more light trailing than any meteor I have seen, was visible for about 2.5 seconds.